Spain on Thursday (23 August) sent back to Morocco 116 migrants who had forced their way into the Spanish territory of Ceuta, in a mass expulsion condemned by human rights activists. “The 116 sub-Saharan migrants who entered Spain via the Ceuta border illegally yesterday (Wednesday) have been sent back to Morocco,” the Ceuta prefecture said in a statement. The migrants made it into Ceuta after storming a barbed-wire border fence with Morocco and attacking police. The Walking Borders humanitarian group described the return of the migrants as a “huge violation of human rights by the Spanish government”. However the Spanish interior ministry defended the “legality” of the expulsion. interpreter and medical aid,” a ministry spokesperson said. “All were told of the possibility of applying for asylum but they didn’t do it,” the spokesperson added, also saying that two minors in the group remained in Spain. Spanish territories Ceuta and Melilla have the European Union’s only land borders with Africa, drawing migrants trying to reach the bloc. Every year sub-Saharan African migrants living illegally in Morocco try to enter Europe either by climbing over border fences or swimming along the coastline. 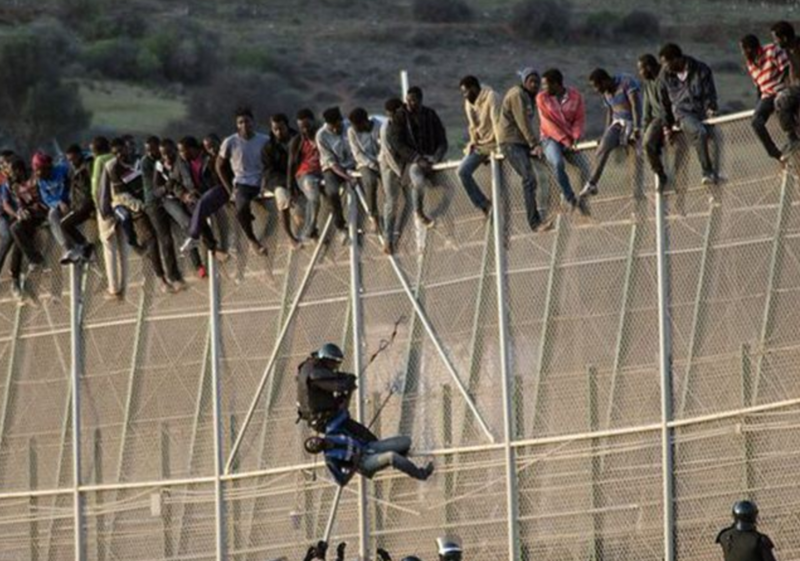 More than 1,000 migrants tried to jump a high double fence between Morocco and the Spanish enclave of Ceuta yesterday (1 January) in a violent assault that saw one officer lose an eye, local authorities said. Some 3,100 migrants have entered Ceuta and Melilla by land since the start of the year, according to the International Organization for Migration. More than 600 African migrants forced their way through the heavily fortified border fence separating the Spanish North African enclave of Ceuta from Morocco on Thursday, using circular saws, shears and mallets to cut through the wire. And over 25,000 others have arrived in Spain by sea, making it the main entry point for migrants arriving in Europe, after Italy and Greece. Can somebody please explain to me since when using force to storm a border post and forcefully invade a country has become a human right? ?